Check out how LeBron James wins basketball games! What do the feet of four-time MVP players look like? Well Lebron James has definitely put some serious wear on his feet and you have to wonder how he won two NBA Championships with those biomechanically unstable feet of his? While vacationing in Europe, James’ feet were noticeably flat and his toes crooked. 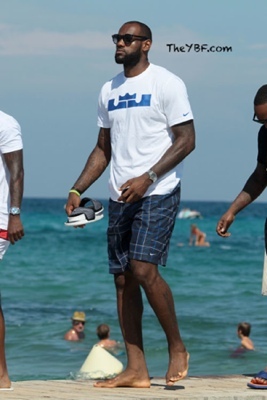 It appears as though King James suffers from a combination of flatfeet, bunions and hammertoes. Flat feet (aka “fallen arches) can cause strain to tendons and muscles in the feet which in turn makes the person feel like his or her feet are tired all the time. Bunions look like a bump on the side of the big toe joint and may even cause your big toe to angulate towards the other toes. Hammertoes are caused by the tendons in the legs overpowering muscles in the feet. This causes the toes to become contracted and painful with walking or activity. Although Lebron suffers from all the above, he needs only one item to distribute pressure more evenly while playing basketball and keeping his feet going strong during the game…and that’s an orthotic! Orthotics are specially made for your feet to help distribute pressure more evenly to your feet and most importantly stabilize your arches. Hundreds of athletes use them to keep their feet in top shape and prevent injury! If you are suffering from flat foot, bunions or hammertoe pain like Lebron, then call Advanced Podiatry at 813-875-0555 and let us help you alleviate your pain!